When I first heard that Korean rapper and BTS member Rap Monster was releasing a song in promotion of Josh Trank's FANTASTIC FOUR, all kinds of crazy thoughts arose. At the top of the list: HOW DID THIS HAPPEN? 20th Century FOX's film isn't set in Korea.There are no Korean actors or foreign demographics covered. 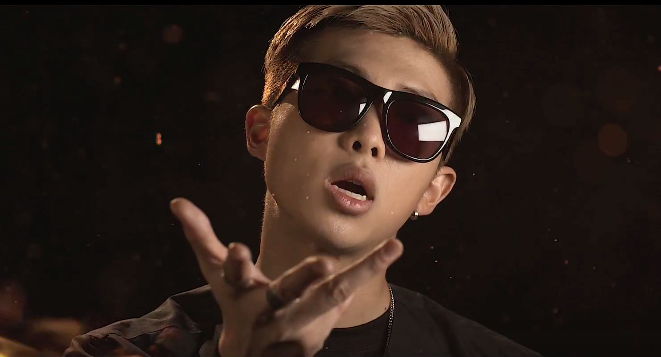 There's no reason to believe that Rap Monster has any relationship with the actors or distribution companies, and the song features a relatively unknown singer Mandy Ventrice, who all but ruins the chorus and song as a whole. Nevertheless, FANTASTIC is a remarkably fascinating, though mixed bag of experimentation that pays off in as many ways as it does confuse and astound. "We gon' burn the night"
"Fantastic, Elastic. I got the thing, thing, thing." Do any of the lyrics make sense? Probably not. It certainly is desired for a Korean to take on the reigns for the chorus and add more of that good old cultural diversity, but what we have isn't too bad either. It's fascinating to see 20th Century FOX expanding their marketing overseas to include South Korea, who's media clout, especially in music has skyrocketed in the last few years. Check out 'Fantastic' below, and if the song has done its job, you may even be watching 'Fantastic Four' this weekend. 'Fantastic Four' stars Miles Teller, Kate Mara, Michael B. Jordan and Jamie Bell.